Learn to cook traditional Moroccan food with the school that was voted Best Moroccan Cooking School in the world. Teaching since 2001. We love Moroccan cuisine and the culture it springs from. We will try to put the food you cook into its cultural context. Our approach is hands on. We believe that the only way to learn is by doing. All of our classes are private so we can teach you what you want to learn, and can design the right class for you. We have a number of different standard formats including short one-hour classes for residents, to half-day and longer classes for residents and non-residents. If you have a particular passion, let us know and we will design something for you. 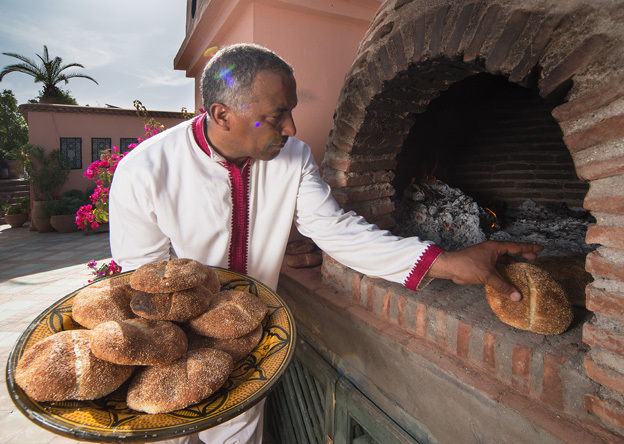 We teach all aspects of Moroccan cuisine including specialist pastry and bread-making classes. We offer classes and cooking experiences for children, families, small and large groups. We cater to amateurs and professionals. Some of the more well known people who have cooked with us over the years include Paula Wolfert, Yotam Ottolenghi, Mourad Lahlou, Choumicha, and countless restaurant owners. If you would like to buy our cook book, you may find the paperback on Amazon.com, or the hardback on Amazon.co.uk.